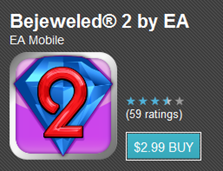 A couple of weeks ago, EA released Bejeweled 2 to the Android Market, and many Bejeweled fans jumped on it like bees on honey. Most found the game in the Market just fine for $2.99, but others were stumped when they saw a whopping $7.99 price tag. Those others were all Verizon customers, as we found out after digging in, because apparently EA decided to release 2 separate, but otherwise exactly identical versions of the game - one for VZW customers and one for everyone else. After being called out by us and a few other blogs, EA came to their senses, quietly lowered the VZW app's price to $2.99, and everything was back to normal again. No hurt feelings, no bad blood - we brushed it off as a misunderstanding, the kind-hearted folks that we are. Fast forward to today, and what do we have in the Market? 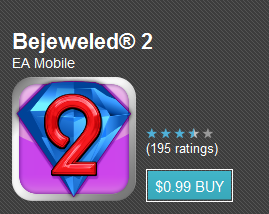 Bejeweled 2 for everyone but VZW customers - on sale for $0.99. 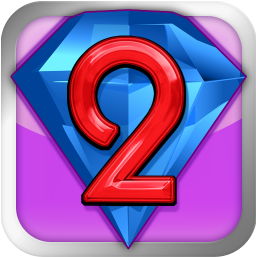 Bejeweled 2 for VZW? $2.99. You have got to be kidding me. Why are you pulling these ridiculous stunts, EA? Are those measly extra dollars really going to offset the uproar you're causing with your discrimination? Why are there 2 versions of the game in the first place? I am disappoint.